Back in February of this year, Eurocom Corporation introduced the desktop replacement Panther 4.0 notebook with an Intel Core i7- 3960X processor. Now, the Ontario-headquartered PC builder announced in a press release that it will be offering the powerful laptop with an Octa-Core CPU, among other things. According to the maker, this is the world’s “first Sandy Bridge-E notebook with a full X79 chipset using the LGA2011 socket”. The successor to the Panther 3.0 portable computer can apparently be equipped with up to an Intel Xeon E5-2690 central processing unit that delivers eight physical cores operating at a frequency of 2.9GHz, 20MB cache and a total of 16 threads. Eurocom is actually calling this one a “mobile server”; claims the laptop weighs 12.1lbs (about 5.5kg) with the built-in Smart Li-Ion 78.44Wh battery. Other features include a 17.3-inch Full HD (1920-by-1080) matte widescreen display, two NVIDIA GeForce GTX 580M graphics cards (paired in SLI), four memory sockets (up to 32GB of RAM) and four physical storage drives (up to 4TB). Mark Bialic, who is the President of Eurocom was quoted as saying: “With such massive amounts of RAM, storage, redundancy and processing power available, the Panther 4.0 is a great tool for virtualization and server class environments. This is the ultimate tool for Engineering Companies to combine with our Mobile Workstations to create mobile engineering teams that can be deployed on customers sites. A desktop component-driven mobile server offers many advantages to traditional laptops”. Reportedly, users will be further provided with two USB 2.0 and three USB 3.0 ports, an HDMI output, Firewire-400, Display Port, DVI-I interface, S/PDIF out, an eSATA port, an illuminated keyboard with dedicated gaming keys, 2MP web camera and an ExpressCard 34/54 slot. 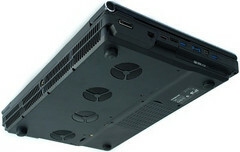 The updated Panther 4.0 notebook is now available; priced at $4,748 (with the Xeon E5-2690 CPU).